A lightweight clear plastic, also known as Plexiglas, Acrylite, and Perspex. Developed in 1928, this material is used for lighter weight applications and is more economical than some heavier duty plastics. During WW2 both sides used this material for windshields and scopes in machines and tools. 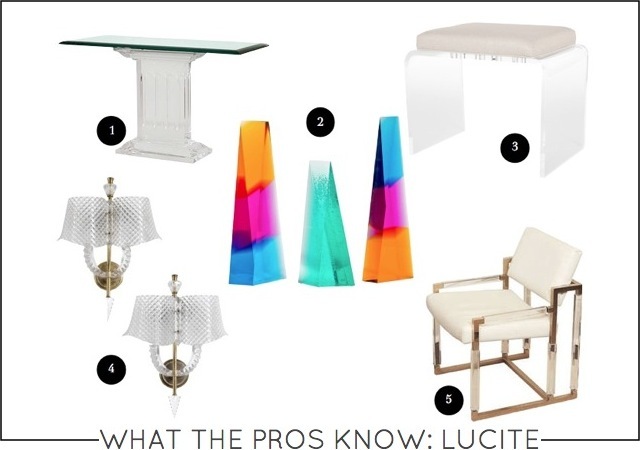 Lucite is used in making almost all furniture types - tables, chairs, case goods, upholstery. It can disappear in a room or adds structure and shape without visual weight. It works well in juxtapositions-Lucite in rustic or traditional interiors create lovely and unique combinations. If you have a space that looks too cluttered with a traditional table or chair, tryaLucite piece to give shape and use without adding clutter. Bunny Williams uses a Lucite coffee table in New York apartment featured in Elle Decor. This Lucite desk balances the dark walls in this study designed by Amy Morris. HGTV featured Lucite table in this traditional space in a traditional shape by Charles Faudree Interiors. The Lucite console table takes backstage to the over-scale poster in the home of Devin Kirk. Eclectic Swedish Home on The Style Files has pair of modern Lucite chairs paired with rustic workspace. Happy Holidays! I'm guest blogging on La Dolce Vita today - talking about what else? Christmas Trees. You can see more Lucite on my Pinterest page.